When a method in a sub class has same name, same number of arguments and same type signature as a method in its super class, then the method is known as overridden method. Method overriding is also referred to as runtime polymorphism. The key benefit of overriding is the abitility to define method that's specific to a particular subclass type. 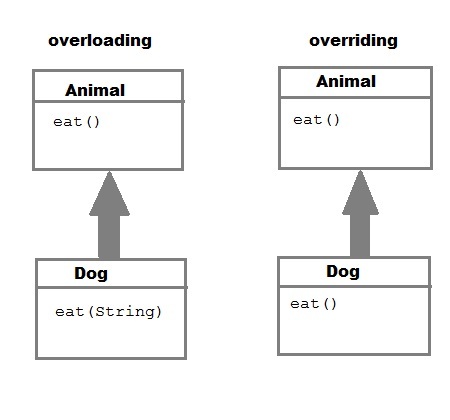 public void eat()   //eat() method overriden by Dog class. As you can see here Dog class gives it own implementation of eat() method. Method must have same name and same type signature. Since Java 5, it is possible to override a method by changing its return type. If subclass override any method by changing the return type of super class method, then the return type of overriden method must be subtype of return type declared in original method inside the super class. This is the only way by which method can be overriden by changing its return type. Access specifier can be changed. Access specifier cannot be more restrictive than original method(can be less restrictive). Q. Can we Override static method? Explain with reasons ? No, we cannot override static method. Because static method is bound to class whereas method overriding is associated with object i.e at runtime.